“Where do I start...?! This is not just a card to say a massive thank you for our fabulous wedding gift but also for all the help and support you have given us both throughout our very exciting journey towards marriage :)! You work so hard and are so passionate about what you do it's lovely! “ I can't let another day go by without thanking you sincerely for all your help, care and advice while I was choosing my wedding dress & all the subsequent fittings. You treated me with such care & went to such great lengths to make sure that my dress was the best ever! I felt really special and cannot tell you how grateful I am for the advice you gave me and mum about mother of the bride dress shops. I did not want my appreciation to go unstated and I would recommend you to any and every bride in Newton Abbot and Devon. 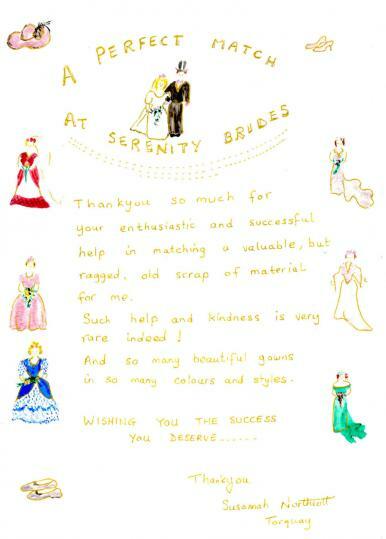 “ I just wanted to say thank you so much for all your help and advice with my wedding dress, veil and accessories. Our wedding was just perfect. I really felt and was treated like a queen for the day. I received so many comments about the dress. “ Both Peter and I wanted to say a huge thank you for your incredible services. We and our families have been so impressed by your enthusiasm for your work, willingness to accomodate anything no matter how big or small. I felt amazing on our big day and my dress was perfect. Peter was blown away by coming down the aisle and thought it was perfectly suited for me. Not forgetting the men who looked very smart and dapper in their suits.